I’ve said before that while I didn’t vote for Obama, I want him to be a successful president. That’s best for the country and for maintaining U.S. power and influence in the world. While it was obvious from the beginning that he lacked experience and had succeeded on the strength of a shallow golden boy image, I had hopes that his intelligence and political talent would bring him through. I also indicated earlier that I was beginning to have doubts that he could handle the presidency, which by any measure is the most difficult job imaginable. Those doubts are now very serious. His instinctive reliance on trying to please those he needs to please and the appearance of success based on photo ops and atmospherics, all abetted by his staff, aren’t cutting it. He’s stumbling on hard-edged issues that can’t be resolved by an excellent prepared speech with an appropriate group of people as a backdrop. There are numerous examples of the bumbling that is likely to continue to damage the President and the country. Let’s look at just three of them. The President made the energy bill now languishing in Congress, including cap-and-trade, one of the major goals of his Administration that he wanted passed during his first year in office. That isn’t going to happen, and as time goes on, especially in the wake of ClimateGate, the bill may never be passed, at least in a form that remotely resembles what Obama wanted. The Copenhagen conference is likely to produce little or nothing of substance because China and India will never agree to emissions limits on developing countries and the U.S. isn’t on-board, among other reasons. However, the President has decided to risk his prestige in Copenhagen once again by dropping in on the conference for one day and addressing the delegates. He’ll do that on his way to accept the Nobel Peace Prize. It’s reported that in Copenhagen he will commit the U.S. to reducing greenhouse gas emissions by 17 percent from 2005 levels by 2050. Where does that come from? Congress hasn’t approved that goal, and it’s doubtful that the people support it. Apparently, he and his staff pulled that number out of their nether regions, and now he’s going to put it on the table in Copenhagen. I suppose he thinks that saying it makes it true, but it’s a miscalculation that he’ll pay for. It’s hard to know who’s making Middle East policy in this Administration. Despite the presence of people who are talented and capable — like George Mitchell, Richard Holbrooke, and Hillary Clinton — what little diplomatic action that has occurred has been ineffective to the point of being potentially disastrous. The problem is so serious that even The New York Times, a very reliable source of support for Obama, has taken him to task in a very critical editorial. The President, probably listening to little more than Rahm Emanuel whispering in his ear, declared that Israel must stop all settlement construction of any kind and that the Palestinians must stop all violence directed at Israel before peace talks can be resumed. However, neither party had agreed to these conditions beforehand. That’s bumbling diplomacy of the worst kind. Israel, naturally, refused but has offered a compromise for a limited amount of time. The Palestinians, having been given the gift of the President’s demand on settlements, are insisting on just that before there can be talks. The rest of the Arab world, which uses the Palestinians as their stalking horse, are offering no assistance in resolving the issue, despite Obama’s intensive overtures toward them. That’s where things stand now — a confused stalemate with no evident U.S. leadership in a region that’s a true powderkeg. The President will announce his decision regarding future strategy in Afghanistan, to include the number of additional troops to be sent, in a major speech Tuesday at West Point — using the cadets and the Academy as a backdrop. Nothing new about the technique; President Bush used troops (and aircraft carriers) in the same way. All presidents do it, and I suppose there’s nothing wrong with the Commander-in-Chief being seen standing in front of his soldiers. And maybe it’s particularly appropriate on this occasion because the decision he’s likely to announce will cost some of those young cadets their lives. There are only two reasonable decisions the President could make at this point — all-in or all-out. Deciding to go all-in would mean that U.S. troop strength in Afghanistan would eventually climb to 300,000 or so, and they would be there for five or ten years. Then we would withdraw, having achieved little or nothing at huge cost in blood and treasure. Even at that point, we won’t have been able to articulate a reasonable definition of what victory would have been. 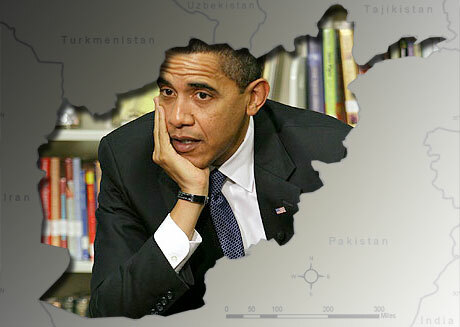 Or, he could take the all-out approach, withdrawing our troops as soon as possible, except for a small security force, and relying on diplomacy, development assistance, offshore military power, and special operations forces to do whatever is possible to help Afghanistan become a modern country free of terrorist elements that threaten the U.S. This approach would mostly fail, also, given the primitive nature of the people we’re dealing with. However, the cost would be far more acceptable. The President isn’t going to opt for either the all-in strategy or the all-out strategy. He’s going to try some middle-of-the-road solution that won’t enrage the Democratic left too much or the Republican right too much. That’s how he’s gotten this far in life — dancing around issues when decisions have to be made, keeping the right people happy, and lookin’ good. Unfortunately, nothing in his life has prepared him for the necessity to sometimes look at everyone around him with a steely stare and declare, “This is the way it’s going to be, whether you like it or not.” The future of his presidency hangs on this decision, and he’s going to blow it. I’ll say it again — I want this President and every president to be successful because I want my country to be successful. That doesn’t mean I agree with Obama on everything he wants, any more than I agreed with Bush on everything he wanted. Unfortunately, Obama is going to be a failed president unless he develops some spine and stops trying to triangulate on issues the way Bill Clinton did. A bumbling president at this point in our history is nothing short of a disaster. It was obvious back in January that Obama was in over his head. Interesting you should bring up Clinton — that man got by on speeches, a forgiving press and support that bordered on maniacal. He didn’t achieve much but has gone down in my state as a great governor and in the nation as an accomplished president. It does appear Obama is trying to replicate Clinton’s particular brand of apparent success. I can appreciate the sentiment that Americans want their president to be “successful” but success is, of course, relative. Success on President Obama’s terms — based on the beliefs that he very apparently holds — would not be, at least by my definition, success for America. THAT’S the song I’ve been singing since he started running for president. We all want America to be a strong rich country; if we reach that plateau again we will be in a position to, among many other things, have a positive effect on developments in foreign countries with a minimum cost of American lives. Success by the president’s standards does not, apparently, include America being strong or rich — success by his standards will make us, best case, an equal partner with every other country in the world (equality being Obama’s fountainhead) — regardless of a country’s politics or how much it disrespects free nations. Worst case? Can you picture us as completely powerless and debt-poor with a country like Iran holding all the cards? My point is, of course, when you wish Obama success, you need to define the terms of that success (which you did by wishing success for America) but you also need to take the feasibility of a desirable result into account. Just a side note: I just noticed the advertisement on this page for Obama’s book, “The Audacity Of Hope”: what a powerful clue to his personality and to his inability to be an effective leader for the greatest country on earth. The title of the book is taken from the title of a sermon preached by Rev. Jeremiah Wright. I’m sure Obama would pick a different title if he could do it over. And just like the title Dreams from My Father, it doesn’t make much sense. I wrote about both books in Dreams and Audacity, including some background on why Dreams from My Father is an inappropriate title.